The Bugaboo Fox 2018 is a new luxury all-terrain stroller that is a cross between beloved Bugaboo Cameleon and Buffalo models. The new Fox is AMAZING! This lightweight, sleek and super sturdy buggy combines the best features from both models making it great for any lifestyle. While weighing under 22 lbs it rolls on large all-terrain wheels (8″ and 12″) that together with all-wheel suspension provide great maneuverability and smoothness. This is probably the lightest all-terrain reversible-seat stroller on today’s market. Impressive! BTW, Buffalo is 27 lbs. The light weight didn’t effect a high weight limit of 48.5 lbs. For comparison the Buffalo has it at 50 lbs and Cameleon at 37.5 lbs. (FIY, the Buffalo model has been discontinued.) The roomy seat has one-hand lever recline with 3 positions and is positioned higher on the frame (at 23″ from the ground) than on Cameleon. There are plenty of options for a newborn. The included bassinet can accommodate a child from birth and up to 20 lbs. You can also convert it into a travel system by replacing the seat with an infant car seat. 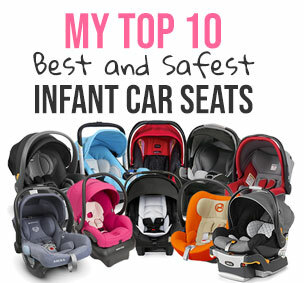 While Bugaboo doesn’t make car seats, it works with most popular brands like Cybex, Maxi-Cosi, Peg Perego and Nuna. Another great feature is an ONE-PIECE fold! You can fold it with the seat or bassinet attached. The unfolding mechanism is also very intuitive. It has a standing fold and automatic lock. It also has large basket, flip-flop-friendly brake, large canopy, adjustable handle bar and swing-away bumper bar. It does NOT have a reversible handle bar like on Cameleon. The customization options on Fox are endless. You can pick your frame, sunshade, seat, and etc. Bugaboo also stepped up in the eco department and used as many recycled materials as they could. The fabric for a single color canopy with bassinet is made from 92 recycled PET bottles. Overall, I think it’s going to be one of the BEST selling strollers this year. Now this beauty comes at a high price of $1,199 for a basic model, but can be customized to cost more. LOL. It comes with a matching bassinet (fabric kit), bumper bar, and a rain cover. -Huge canopy. The canopy has two large panels and one zipped-in panel that makes it absolutely anormous. It goes all the way down pass the bumper bar. Unfortunately just like all Bugaboo models it still does not have a peekaboo window. I also would like to see a mesh somewhere on the canopy for better air circulation on a hot summer day. Now, if you live in a warm climate, you can get a so called ‘breezy sun’ type of canopy that has mesh on all the sides. -Telescoping handle bar. The telescoping handle bar goes from 34″ up to 42″ from the ground. Great for shorter and taller parents. It does not reverse like on Cameleon model. The handle bar is covered with nice vegan leather that you can also customize. To avoid tipping the stroller backwards, hang your diaper bag on the frame using stroller hooks. You can also use it to hang your water bottle, or shopping bags. -Reversible seat. The seat is very roomy. It is 13″ wide and 23″ high from the back of the seat to the top of the canopy. The depth of the seat is 10.5″ with a 6.5″ leg drop. It can hold a child from 6 months and up to 48.5 lbs (Cameleon has a lower weight limit at 37.5 lbs). Since the seat is one molded piece, it will keep its ‘V’ shape when reclined, so your child is ALWAYS in a sitting position even when he is sleeping. I do prefer a flat recline where only the back of the seat reclines. The good news is that the seat has 3-recline positions that are adjusted by pushing ONE-HAND lever on the back of the seat unlike Cameleon where you need to use both hands to push buttons on the side of the stroller. Easy! To reverse the seat all you need to do, is push two buttons on both sides and swing it around. Now, your child will be facing you. The seat is made out of durable material that is also machine washable. Another cool thing about the seat is that it’s positioned higher on the frame (23″ from the ground) than on Cameleon bringing your child closer to you and promoting better bonding. I know that this is an important feature for a lot of parents. -Bumper bar. INCLUDED! It is a removable swing-away rotating bumper bar that is covered with vegan leather. You can also customize it to match your colors. -Large basket. It has a large easy-to-access basket that can fit up to 22 lbs (this is a lot of stuff). It doesn’t have a cover like on Cameleon. You can fit your largest diaper bag with no problem. There are also smaller pockets inside of the basket for smaller items. Since there is no other storage, I would recommend getting an universal stroller organizer. That way you can take not only your coffee cup, but also a LOT of stuff including keys, phone, water, wallet, snacks, diapers, toys, and more. The amount of stuff it can fit is unbelievable. -Flip-flop-friendly brake. So unlike other Bugaboo models Fox has a flip-flop-friendly foot pedal that you press to lock the brakes. Finally! I am not sure why it took Bugaboo so long to come up with an easy to operate friendly brake. -All-terrain wheels. It rolls on four all-terrain foam-filled rubber wheels with 12″ wheels in the back and 8.5″ in the front. For comparison, Cameleon has 6″ and 12″ wheels, so the front wheels are slightly smaller. To remove the rear wheels, you just need to push a white button and the wheels pop right off. The front wheels are swivel, but can be locked straight for more stability. These wheels can tackle ANYTHING! The maneuverability on Fox is outstanding. You can push it with one finger. -Two-wheel mode. Just like Cameleon Fox has a two-wheel mode. You can actually remove the small wheels and reconfigure the frame to transform it into a two-wheel mode. While in this mode it will be easier to get over snow and sand on the beach, it is not very stable, so I wouldn’t go very far. You will need to remove your child from the stroller before converting it. -All-wheel suspension. Fox features great all-wheel suspension system (Buffalo has none). -Easy fold. The fold is very easy and is one-piece so you don’t need to remove the seat nor the bassinet. Thank God! There was SO many complaints from parents who said the frame would lock up sometimes on the Cameleon. Have you ever seen crazy looking parent kicking and hitting a stroller out on the parking lot? That was probably a lucky owner of a Cameleon. LOL. Not on Fox! The fold is pretty smooth. All you have to do is pull two levers on both sides and the frame will fold. There is an automatic lock and a standing fold. The folded dimensions with the seat attached is 34.6″L x 23.6″W x 15.7″H. Bulky! I also wish there would be something preventing the handle bar and the basket from scrapping the floor every time you fold and unfold it. -Matching bassinet. INCLUDED! One of the selling points of the Fox is an included bassinet. You can easily convert your stroller into a pram by replacing the seat fabrics on the frame with the bassinet fabrics. You can fold the stroller with the bassinet attached and it still has the standing fold. BTW, the fabrics for the seat and bassinets used to be attached to the frame (on Cameleon and Buffalo) with Velcro and now there is a zipper system for that. -Stroller board option. You can get a stroller board so that your older child can keep up. -Bulky. It will take a LOT of room in your trunk. That big one-piece seat and the frame will not fit in a smaller car unless you take everything apart, but who has time for that? -High price. It retails for $1,199 which is one of the most expensive strollers on the market. Here is a video overview of Fox. With Fox the color combinations are endless. Choose the frame color, seat fabric, sunshade, wheel covers, handle bar cover, and bumper bar cover. You can get Bugaboo Fox 2018 for around $1,199 (free shipping) The price can vary depending on the colors and customization. This is an expensive luxury stroller that doesn’t have any good sales. It does include a bassinet, bumper bar, and rain cover. Everything else needs to be purchased separately. I would suggest skipping the cup holder and getting an universal stroller organizer instead. That way you can take not only your coffee cup, but also a LOT of stuff including keys, phone, water, wallet, snacks, diapers, toys, and more. The amount of stuff it can fit is unbelievable. And, the best part is that you can use it on ANY of your strollers. I’ve gone through thousands pram reviews in the internet but still cannot choose the stroller… Could you please recommend me what’s better: Bugaboo Fox or Stokke Trailz? Actually I’m I’m love with Stokke but it seems to be so heavy and bulky. But at the same time isn’t its amortization better? I live on the 2nd floor with no elevator and I’ll have to get the stroller up and down somehow like jumping from one step to another… My back isn’t in the best condition so maybe smth lighter would make sense, but I really need all terrain thing. Please give me a piece of advice, which one would you prefer? Do you know if the Nuna Pipa light car seat adapter that works with the Cameleon 3 will also work with the Fox? I called Nuna customer service and they said, it hasn’t been tested, so we cannot say…but do you know if “off the record” it will work with the newer model?